WASHINGTON, DC – Brazilian President Jair Bolsonaro is planning to take the country’s relationship with the U.S. to an “ambitious” new level, Brazilian Foreign Minister Ernesto Araújo said at a press conference Thursday. “We have very ambitious views of what this new partnership should look like, and I’m pretty sure from what I sensed, those views are to a large extent shared by most, if not all, of our American counterparts,” said Araújo. 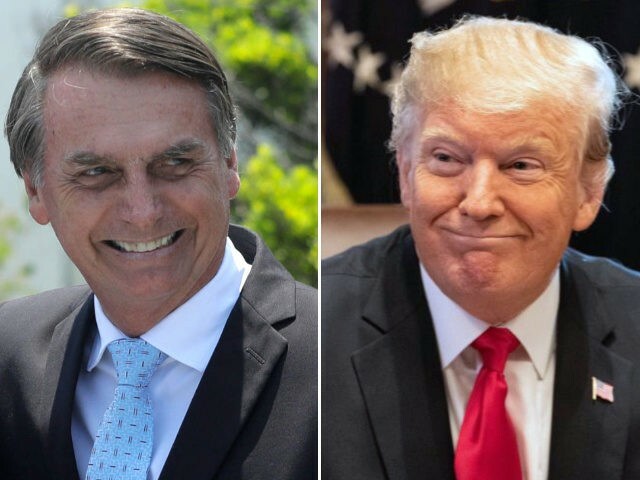 His visit comes ahead of a planned visit by Bolsonaro to the White House, which would be the first meeting between the two presidents. Dubbed the “Trump of the Tropics,” Bolsonaro won Brazil’s presidential election on an outsider platform in October, taking office on January 1. Araújo, during his visit to Washington this week, met with representatives of the administration, Congress, business community, and press. He said he sensed “enormous interest” from those meetings for bringing the U.S.-Brazil relationship to a new level on trade, defense, and shared values. Trade being such an important part of Brazil-U.S. relations, we expect that any sort of package of meaningful measure that we would like to take under this new vision would have a strong trade component, not necessarily a free trade agreement, but maybe more than one instrument that would facilitate trade and open trade that is also part of Brazilian government’s program, a more open and more competitive government, so this would totally be inside our priorities. We did talk about the common interests that Brazil and the United States agricultural sector share in many ways. Of course, we are competitors in many ways as well, but with different interlocutors, we have commented that we probably have the two strongest agricultural sectors in the world and we should talk about that, and make that something that is good for the relationship. Araújo expressed full support for the U.S. and international community’s efforts to back interim Venezuelan President Juan Guaidó over former President Nicolás Maduro, who is refusing to give up power despite widespread chaos and starvation across the country. “We are seeing more and more momentum in favor of the Democratic transition in Venezuela,” he said. We really think the Democratic process can and will go forward with political and diplomatic means, efforts of the international community, and especially efforts of Venezuelans themselves. I’m pretty sure the perception that political means are what is driving the situation forward, and we can totally go forward using those diplomatic means. Concerns over a potential military confrontation have risen as Maduro remains protected by Russian military contractors, Cuban troops, and some members of the Venezuelan military who have not switched their allegiance to Guaidó. Additionally, Maduro has been using the military to block the entry of international humanitarian aid from reaching Venezuelans on the Colombian border. This is what we were aiming for: to help the Guaidó government to feel supported, to feel that they are the only option for the international community, and from there, to build a position of strength to talk with the military and gain their support, so I think that’s our main task now from the international community. “They have the moral superiority, that’s very clear, and that’s what matters I think at the end of the day,” he said.